This time it was no hype. Sandy rampaged through New York, New Jersey and the rest of the Northeast. The damage has been enormous: more than a hundred dead, massive flooding everywhere, collapsed buildings, generator malfunctions in hospitals, multiple fires, city-wide blackouts and explosions in power plants. 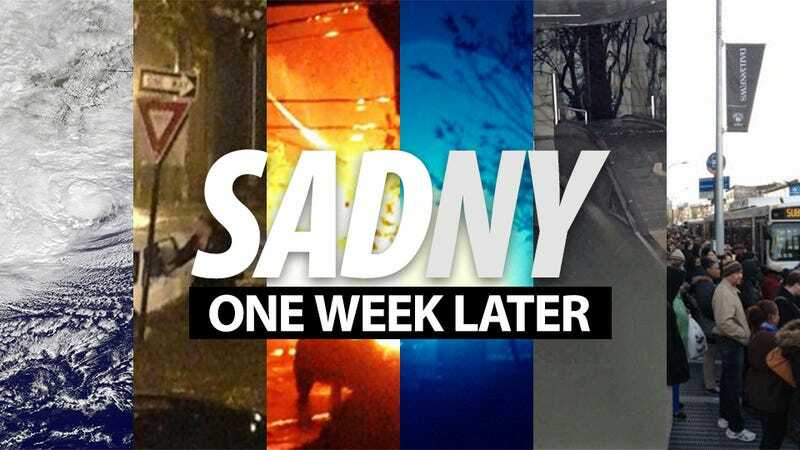 This is the complete story of Sandy, one week later—a chronological timeline. Sunday is approaching. Not many people are taking it seriously, thinking it's going to be another false alarm like Irene. But NOAA and NASA have published this global view, taken by NOAA's GOES-13 satellite this morning, October 28 at 9:02AM EDT. It looks much larger. 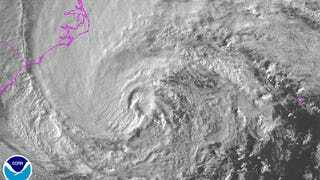 Update 2: NASA just issued this photo showing Sandy hitting Cape Hatteras, Chesapeake Bay and Delaware Bay. Update 3: Latest video from NASA/NOAA's GOES-13 weather satellite, showing hurricane Sandy's progression from October 16 to October 28 at 5:00pm EDT. Update 4: Latest progress of hurricane Sandy taken by NASA/NOAA's GOES-13 weather satellite from 5:10pm EDT to 9:10pm EDT. Latest image from NASA/NOAA's GOES-13 weather satellite, taken today at 9:10pm EDT. THIS HAS THE POTENTIAL TO BE A LARGE AND RECORD SETTING STORM, WITH WIDESPREAD WIND DAMAGE, INLAND AND COASTAL FLOODING, AND BEACH EROSION. THE COMBINATION OF THE HEAVY RAIN AND WIND WILL CREATE THE POTENTIAL FOR WIDESPREAD POWER OUTAGES AND SIGNIFICANT FLOODING. AT THIS TIME, THE MOST LIKELY TIME FRAME FOR THE WORST OF THE RAIN AND WIND LOOKS TO BE MONDAY AND TUESDAY. THIS MEANS THERE IS STILL TIME TO PREPARE. Update 7: A full day of Sandy. Time-lapse video from 22,300 miles, from 7:15am to 6:30pm EDT. NASA animation by Kevin Ward, using images from NOAA and the University of Wisconsin-Madison Cooperative Institute for Meteorological Satellite Studies. taking action in anticipation of Hurricane Sandy"
FACT...A LITTLE STRENGTHENING IS POSSIBLE DURING THIS PROCESS. SANDY IS EXPECTED TO WEAKEN AFTER MOVING INLAND. 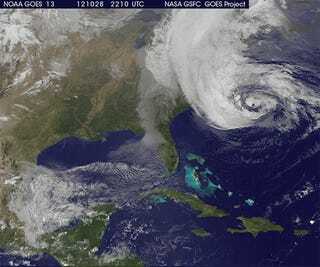 AT 500 AM EDT...0900 UTC...THE CENTER OF HURRICANE SANDY WAS LOCATED NEAR LATITUDE 35.9 NORTH...LONGITUDE 70.5 WEST. SANDY IS MOVING TOWARD THE NORTH NEAR 15 MPH...24 KM/H. A TURN TOWARD THE NORTHWEST IS EXPECTED TODAY...FOLLOWED BY A TURN TOWARD THE WEST-NORTHWEST TONIGHT. ON THE FORECAST TRACK...THE CENTER OF SANDY WILL MOVE OVER THE COAST OF THE MID-ATLANTIC STATES THIS EVENING OR TONIGHT. REPORTS FROM AN AIR FORCE HURRICANE HUNTER AIRCRAFT INDICATE THAT THE MAXIMUM SUSTAINED WINDS HAVE INCREASED TO NEAR 85 MPH...140 KM/H...WITH HIGHER GUSTS. SANDY NOW MOVING NORTH-NORTHWESTWARD AND ACCELERATING... AT 800 AM EDT...1200 UTC...THE CENTER OF HURRICANE SANDY WAS LOCATED NEAR LATITUDE 36.8 NORTH...LONGITUDE 71.1 WEST. SANDY IS NOW MOVING TOWARD THE NORTH-NORTHWEST NEAR 20 MPH...32 KM/H. A TURN TOWARD THE NORTHWEST IS EXPECTED LATER THIS MORNING...FOLLOWED BY A TURN TOWARD THE WEST-NORTHWEST TONIGHT. ON THE FORECAST TRACK...THE CENTER OF SANDY WILL MOVE OVER THE COAST OF THE MID-ATLANTIC STATES THIS EVENING OR TONIGHT. Update 12: Latest NOAA update keeps keeps the same prediction—it's expected to turn northwest and west-northwest later today. NOAA says that it's not going to weaken and, worse, "a little strengthening is possible." Update 13: If you think Sandy is going to be just another Irene fizzle, think again; this animated GIF shows just how much stronger Sandy is at this stage in the game. And it's only getting stronger. Update 14: NPR just reported that Starbucks have closed all its locations in NYC. How's that for a disaster? They also say this may be the biggest storm ever in the region. Update 15: NASA's night shot, acquired by the Visible Infrared Imaging Radiometer Suite (VIIRS) on the Suomi NPP satellite around 2:42am EDT. "The Hudson River has breached it's banks 8.53 am" by Nigel Barker. "East River rises above last two steps of Get Down, and approaches 3rd, at end of Wall Street" by Arturas Rosenbacher. "Here we are marooned in Red Hook, Brooklyn!!" by Greenpainting. "The flooding in the Jamaica Bay, Queens neighborhood of Meadowmere. Courtesy of Kim Zatto, bait purveyor" by Corey Kilgannon. Hurricane-force winds are expected from Chincoteague, Virginia to Chatham, Massachusetts. 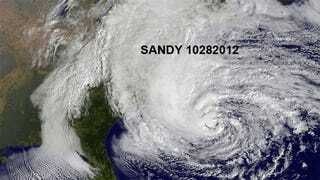 AT 1100 AM EDT...1500 UTC...THE CENTER OF HURRICANE SANDY WAS LOCATED NEAR LATITUDE 37.5 NORTH...LONGITUDE 71.5 WEST. SANDY IS MOVING TOWARD THE NORTH-NORTHWEST NEAR 18 MPH...30 KM/H. A TURN TOWARD THE NORTHWEST IS EXPECTED SOON...FOLLOWED BY A TURN TOWARD THE WEST-NORTHWEST TONIGHT. ON THE FORECAST TRACK... THE CENTER OF SANDY IS EXPECTED TO MAKE LANDFALL ALONG OR JUST SOUTH OF THE SOUTHERN NEW JERSEY COAST THIS EVENING OR TONIGHT. REPORTS FROM AN AIR FORCE HURRICANE HUNTER AIRCRAFT INDICATE THAT THE MAXIMUM SUSTAINED WINDS HAVE INCREASED TO NEAR 90 MPH...150 KM/H...WITH HIGHER GUSTS. SANDY IS EXPECTED TO TRANSITION INTO A FRONTAL OR WINTERTIME LOW PRESSURE SYSTEM PRIOR TO LANDFALL. HOWEVER...THIS TRANSITION WILL NOT BE ACCOMPANIED BY A WEAKENING OF THE SYSTEM...AND...IN FACT...A LITTLE STRENGTHENING IS POSSIBLE DURING THIS PROCESS. SANDY IS EXPECTED TO WEAKEN AFTER MOVING INLAND. "This is the FDR Drive. It is underwater" by Mike Ryan. Update 21: Progression of Sandy as it approaches "more quickly" to New Jersey shore. The situation there is worsening by the minute. NOAA's National Severe Storms Laboratory says that blizzard conditions will happen as Sandy meets with the cold system coming from the great lakes. Update 22: A crane has collapsed in a Manhattan skyscraper on West 57th Street and 6th Avenue. FDNY is responding to the threat right now. Update 23: Some last minute advice. If the power goes off, remember that you can access the internet via text message to get the latest alerts. Here's how to do it. Remember to have all your gadgets and batteries fully charged. If you have dogs, here's a guide on what to do with them and which shelters accept pets. 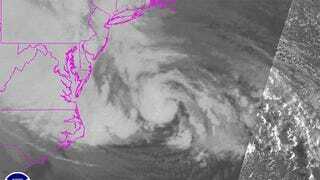 Update 26: NOAA's latest update at 5:00pm EDT: "Sandy is moving quickly toward southern New Jersey and Delaware. Landfall is expected early this evening accompanied by life-threatening storm surge and hurricane force winds." Building is 92 8th Ave, where "Muscle Maker Grill" is on Google Street View... listening to the FDNY radio calls. Lots of units responding, no one trapped though...Nobody trapped in collapsed Chelsea building, per FDNY radio calls...BREAKING: 4-story apartment building collapse at 8th Ave and 14th St.
"Here's a before/after of the collapsed building on 14th st" by Lucky Lefty Art. The Empire State is the only light in the sky by Idan Coeh. Update 36: Oyster Creek nuclear plant has declared an alarm at 9:00pm, as water levels increase. The U.S. Nuclear Regulatory Commission is continuing to monitor impacts from Hurricane Sandy on nuclear power plants in the Northeastern United States, including an Alert declared at the Oyster Creek nuclear power plant in New Jersey. The plant, currently in a regularly scheduled outage, declared the Alert at approximately 8:45 p.m. EDT due to water exceeding certain high water level criteria in the plant's water intake structure. There's no plan to shut down the plan, as water levels are expected to recede. You can read the official document here. Update 37: According to NOAA's 11:00pm EDT update, Sandy's center is moving through Pennsylvania, and is 10 miles from Philadelphia. It will go up to western New York on Tuesday night. AND NORTHEAST IS FORECAST TUESDAY NIGHT. ON THE FORECAST TRACK...THE CENTER OF SANDY IS EXPECTED TO MOVE ACROSS PENNSYLVANIA DURING THE NEXT DAY OR SO...THEN MOVE INTO WESTERN NEW YORK TUESDAY NIGHT. MAXIMUM SUSTAINED WINDS ARE NEAR 75 MPH...120 KM/H...WITH HIGHER GUSTS. THE STRONGEST WINDS ARE OCCURRING OVER WATER TO THE EAST OF THE CENTER. STEADY WEAKENING IS FORECAST DURING THE NEXT 48 HOURS. Update 39: Check out this photo from LaGuardia Airport, completely flooded. Watch one of the many trees falling. This is how some of the fires started in Queens, New York. Video by Tina Amini. Read her story here. This video of Atlantic City's boardwalk really shows the scope of the destruction. Some blocks are completely gone. Breeze Point after the fires. Things are bad north of New York City too. Strong wings put this boat on the Metro-North tracks at Ossining, in Westchester County. National Guard assistance to local first responders and the Federal Emergency Management Agency included support at evacuation shelters, route clearance, search and rescue and delivery of essential equipment and supplies. Guard members were assembling and staging in Connecticut, Delaware, Maryland, Massachusetts, New Hampshire, New York, North Carolina, Rhode Island and Virginia, according to the National Guard Coordination Center, which monitors the response spearheaded by the states. "House off foundation due to storm surge on Row Carpenter Beach in Charlestown, RI." by the NWS. Update 45: These images of the MTA Subway show the extend of the flooding. There are stations which are completely submerged. On a rainy day, the pump system is absolute chaos, to the point where the MTA-NYC's Metropolitan Transportation Authority-lives in permanent panic, fearing events like Sandy every year. "At some point, it would be too much to handle," said the head of the hydraulics team back in 2006, Peter Velasquez Jr., "you've got rain plus wind. It basically would shut down the system. You hope not. You pray that it doesn't. "To give you an idea about how bad this could be, some of the oldest pumps in the NYCTA system were bought second-hand from the builders of the Panama Canal. I worked for the TA many years ago and even then the pumps were considered a serious problem. The Panama Canal was finished in 1914." Update 46: The Long Island Rail Road tunnel getting flooded by Sandy. Brooklyn 2nd Alarm *22-3610* 706 Brighton Ave. Dv20 requesting 2nd Alarm for a heavy fire through the roof of a 20x50 2 Sty building. AT 0500 AM EDT...0900 UTC...THERE WAS NO DISCERNIBLE SURFACECIRCULATION FOR THE REMNANTS OF SANDY. SANDY HAS WEAKENED INTO ASURFACE TROUGH OF LOW PRESSURE OVER WESTERN PENNSYLVANIA. NYC Transit and MTA Bus continue efforts to restore service following Hurricane Sandy. Bus service will operate on a fare-free basis today. Local, Limited-Stop and Express Bus service will operate as close to a normal weekday schedule as possible today. Update 55: Fire, wind and water. A trains will operate in 2 sections locally: btwn 168th St Manhattan & 34th St | btwn Jay Street & Lefferts Blvd. Update 57: We have created a gallery exclusively dedicated to the severe floods in New York and New Jersey. Click here to see it. Update 58: NYC is trying to return to normality, but things are hard. The public transportation is coming back to life but the bus lines at rush hour have been 3 to 4 hours, BetaBeat reports thanks to the subway situation. Update 59: More good news-Con Edison is steadily reestablishing power through New York. All of Manhattan may be fully powered as early as tomorrow, Saturday at the latest. Update 60: The situation in gas stations is bad, as electricity have left pumps dead in many places. The traffic in and out of Manhattan is terrible too at rush hour. "...another packed gas station. Police have to monitor them!" by James M.
"Line of people outside a #Queens #gasstation keeps on growing. Police directing traffic flow" by Alexa Mae Asperin. Update 61: Sadly, while Manhattan will be fully lit tomorrow or Saturday, some Con Edison costumers will not get power back any time soon. They are saying ten more days of wait for "the vast majority" of customers knocked down by Sandy. Some will have to wait until the end of the month. Right now, the amount of unpowered customers is about 600,000, down from 850,000. Update 62: Just a great photo of kids in New York. We're moving forward. No further comment needed. Update 63: The situation is more or less the same as yesterday: mass lines for buses and gas stations and traffic jams. Con Edison keeps working to restore power in Lower Manhattan. Subway between Brooklyn and Manhattan may resume within hours, says New York's Governor. The MTA is hopeful that the No. 2, 3, 4 and 5 lines and trains that travel over the Manhattan and Williamsburg Bridges — the B,D,N, Q, J, M and Z will have Brooklyn-Manhattan service by day's end, the Daily News has learned. Manhattan and Bayonne cruise ship terminals are now open. The Brooklyn cruise ship terminal remains closed. Ferries and taxi services are operational on the Hudson and East Rivers. Port Jersey Channel is open. Gravesend Bay anchorage is open. The Hudson River is open to all vessel traffic. Update 65: Meanwhile, the city is giving food and water to those who need it most at different locations. You can check them out here (they are updating the list live). 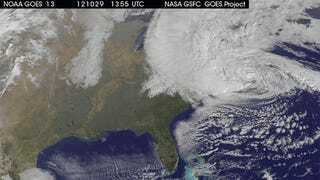 Update 66: NASA has published a really good video summary of what caused Sandy. A must watch. Update 67: It's 4:58pm and power has been restored in the Lower East Side and Chelsea. People are cheering on the streets! Seems like Con Edison is going to make it and the entirety of Manhattan will haver power today. I've never been so happy to see a traffic light! Image of the 1st Avenue and 10th street taken a few minutes ago by Brian Thatcher. This is really good news. It means that the subway power-up of many lines is also imminent. Sadly, this doesn't mean that we are free from the blackout yet. Many people still need power in parts of New York and New Jersey. Update 69: While most of Manhattan now has power, the situation is still bad in Staten Island, some parts of Brooklyn and New Jersey. Update 70: Con Edison has now restored power to 70 percent of the people affected by Sany. Con Edison crews have restored electricity to more than 700,000 customers, or approximately 70 percent of all those who lost power since Hurricane Sandy slammed through New York. Nearly 950,000 Con Edison customers were affected by the storm. Update 71: The MTA reports that the South Ferry subway station is now completely dry. The South Ferry station, which had been a large fish tank, has now been pumped dry. It's only been a week since Sandy struck, but it seems like a month already. The drama continues everywhere. There are still hundreds of thousands of people without power. Many don't have a home to return to. The recovery is going to take months and the damage is not only in New York and New Jersey, but through the entire Eastern Seaboard. Many have lost everything in the United States and in the Caribbean. FEMA, the National Guard, fire departments, police forces, and non-governmental organizations like the Red Cross are working hard through New York, New Jersey and the rest of the affected states declared emergency areas by President Obama. Their work has been amazing so far, but there's still a long road ahead. We need to keep supporting them. If you are in the disaster areas, you can contact local help groups to donate your time and whatever you can give away. And remember you can always donate through the Red Cross by clicking here or buy supplies through the Sandy Relief registry list at Amazon here.